Since it was released, I've been trying to decide what I think of Super Mario Galaxy. I know that it's at least a very good game, and it exhibits the usual creativity and quality of the Super Mario games, but is it maybe even something more? Is it actually a revolution in the platform genre, as a number of reviews have said—and as the game's Famitsu (38/40), Metacritic (97), and Game Rankings (97.4) scores may suggest? If you follow this blog, then you know that I'm probably not going to spend a whole lot of time talking about Super Mario Galaxy without first discussing its aged forebears, so I'll dispense with the pretext right now and get on with what this essay is really about, which happens to be Super Mario Bros. SMB certainly wasn't the first platform game—the first, um, good one was Donkey Kong, which followed a couple of less remarkable pioneers—nor was it actually the first scrolling platform game (and let's just leave it at that), but it was the game that happened to popularize the genre, and it has the added distinction of making it obvious to the American business world that home console gaming was a viable, permanently marketable, um, thing. As much as I do love the VCS, it's important to note that Atari had not managed to convince people of this by 1983. I've written about this before, and I've said that I think a lot of this had to do with the way that early NES games distinguished themselves from the arcade experience in crucial ways, though admittedly I focused more on aspects of play control than the trajectory of gameplay. But let me reiterate that what post-SMB console games offered was not the arcade model, the iterative, short game with levels that the player experienced repeatedly and, most importantly, with no end to the procession of levels, unless it was a hardware-imposed kill screen. SMB was the catalyzing agent that popularized a new model of game design: games with actual goals. We might as well call these teleological games. As is completely appropriate for an early representative of this "paradigm," SMB exhibited the marks of where video games had been as well as where they were going. While SMB had thirty-two distinct levels, grouped into eight worlds of four levels each, it is true that the levels were only slight variations on five basic types: simple outdoor levels, underground levels, high outdoor levels with advanced platforming challenges, water levels, and castle levels. As such, there was some repetition, but it was not the same precise iteration seen in titles like Donkey Kong or Gorf. And whereas these games would simply repeat the cycle of levels without any resolution (DK did have a minimal storyline, but this only played out in the first two levels), SMB was plainly over after the last of its thirty-two levels were completed. There was even a mechanism that marked the final castle level out as something different: rather than the Mushroom Retainers who appeared seven times before—and my six-year-old self, clueless as to the number of times I'd have to find out that the Princess was in another castle, came to hate these guys—Mario discovered Princess "Toadstool" herself, and that was that. This became, I think, the prevailing paradigm for game designs throughout the console's life, and I think it's safe to say that, for the most part, this has been the case ever since. The titles most often associated with the NES, including the Castlevania, Mega Man, Legend of Zelda, Dragon "Warrior," and Super Mario Bros. franchises, as well as Final Fantasy and Metroid, followed this design model. What this meant, though, was that games had to show not just the distinction between beginnings and endings but the whole spectrum of locales in between these two endpoints. 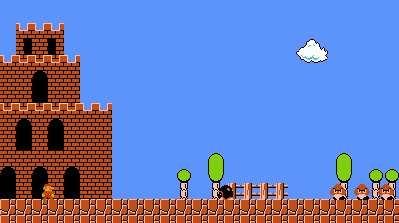 SMB might only have had five distinct level types, but it used those types in ways that suggested change and progress: outdoor levels were often given a black rather than a blue background, suggesting a transition from day to night, and level 6-3 even changed the color of everything including the bricks, the tufty raised platforms, and the castle at the end, to shades of white and light gray, suggesting a thick snowfall; levels 3-1, 3-2, 5-1, 5-2, and 7-1 had trees with white-colored tops and white pipes that suggested, I guess, a lighter dusting of snow. 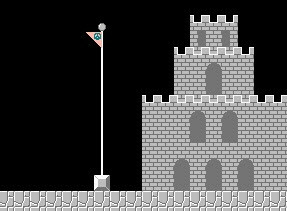 All of this made levels seem more distinct during the experience of gameplay, and it gave context to the consistent four-level cycle that always culminated in a (futile) attempt to save the Princess from another castle. For me, then, the move from "world" to "world" felt like a progression from region to region (province to province?) within the Mushroom Kingdom. Mario traveled gradually through the four stages of each "world," and when he reached each castle, always inexplicably in the "world's" most remote location, he discovered that, yes, he had to keep moving. The large castles that always appeared at the beginning of levels numbered 1 (excepting 1-1 for obvious reasons and, bizarrely, 5-1) gave a sense of continuity to the proceedings, and it reinforced the impression that Mario was on some sort of quest that, for all its repetition, was advancing in some sense. So Super Mario Bros. was something of a tenuous first step. Only minimal differentiation existed between levels, but there was nevertheless a great deal of difference between Super Mario Bros. and earlier level-based games like Donkey Kong. Super Mario Bros. also distinguished itself from its few earlier competitors in the side-scrolling platform genre, like Pac-Land, by exploiting a repetitive pattern in such a way that its ludic and (admittedly thin) narrative qualities appeared to blend seamlessly. Still, the world that Super Mario Bros. took place in was a product of cooperation, a construct of the player's mind just as much as it was a part of the game's program. 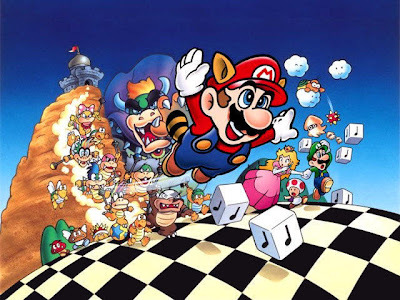 It would still be some time before the Super Mario Bros. games managed to present a world that made sense on its own terms, and it is the progress towards this point, and the movement away from it that I think has occurred since, that I've set out to explore throughout the present series of essays. The next part will continue with the next two games, and there are a number of other issues I'm looking forward to bringing out, too. Please anticipate it (and, in honor of Chris Kohler's wit: bow). All images come from Ian Albert's brilliant webpage, where the author presents several video game maps created from in-game graphics. Just like Nintendo Power, only all nice and stuff. You know, it's amazing how so many people can say nearly the exact same thing in different types of ways. Specifically my initial posts on the first two Famicom Metal Gear titles share some relation with this. The princess is always going to be in another castle to an extent. I'm currently waiting for the day that developers learn how to thicken the veil so to speak so the player won't see as much of the game as they do a seamless transition of experiences. I think that's why so many people have mixed feelings about Nintendo's stance right now. They started the more disciplined approach to designing games and it's flourished ever so slightly over the past two decades. What's really amusing to me is that I relate some similar sentiments to this despite the fact that Metal Gear is actually a story driven game, even in it's 1986 progenitor. Diametrics are fascinating.